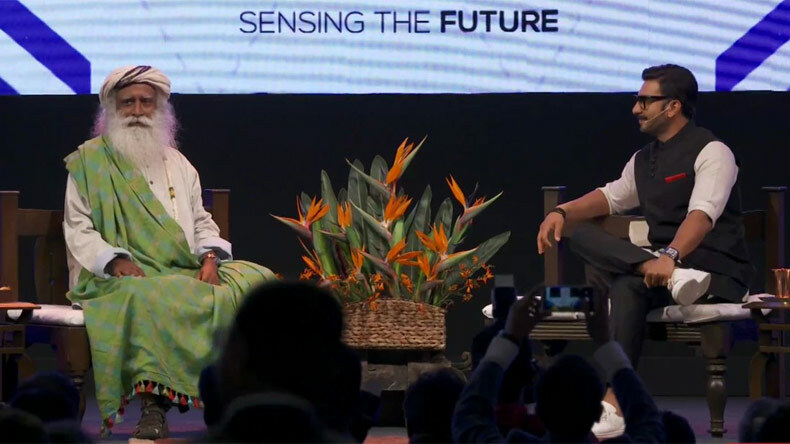 Bollywood actor Ranveer Singh and spiritual leader, Sadhguru were recently seen shaking a leg with each other at an event that took place in IIM Bangalore. Ranveer took to his Twitter handle where he shared the amazing video, which shows that the duo had a great time with each other. It is next to impossible when it comes to stopping Ranveer Singh dancing. His quirky and infectious dance style can make you sway with him and that is something you can’t deny. Recently, the Padmavati actor shared a video via his Twitter handle, which shows that nobody, literally nobody can get away from his dynamic dance moves. And, this time it was the spiritual leader, Sadhguru who could not resist himself to shake a leg with the Bollywood actor. In the video shared by Ranveer Singh, the two of them were seen dancing together and it seems that both of them had a great time with each other. The whole incident took place at IIM Bangalore for their alumni event, IIMBue, where the duo of the actor and the guru shared the dynamic moment. Both of them were seen jumping in joy on the stage. Not only the grooving part but the hug that came after it also caught a lot of attention. Ranveer once again proved that it is a bit difficult to escape from his infectious dance moves. Ever since Ranveer had posted the video, the video has been doing the rounds on the Internet. It has garnered over thousands of likes and has got retweeted for several times. Twitterati also got into a frenzy after coming across the video that features Sadhguru, in a way that has never seen before. Here we have compiled some of the tweets from Ranveer Singh’s fan that have surfaced after the actor shared the remarkable video through his Twitter handle. On the work front, the actor will be next seen in Rohit Shetty directed Simmba. Besides Simmba, Ranveer has been also gathering headlines for Zoya Akhtar’s Gully Boy, where he will be seen opposite to Alia Bhatt. The actor has also lined up Kabir Khan’s 83, which is one of his much-awaited projects.